Probably the most popular spot for kiteboarders and windsurfers is Shacks Beach, Puerto Rico. Now I know what you’re thinking – there are things such as “beach shacks”, but this beauty is called Shacks. It’s located in the little town of Isabela on the northwest point of Puerto Rico. Come here to enjoy water sports. Most days you can see as many as a dozen intermediate kiteboarders on the water. Shacks Beach is big and you’ll not be in the way. If you are a boarder, know that the wind blows in the same direction as rip currents: offshore, so make sure you know how to tack back in. As anywhere, beaches with surf are dangerous and the very best thing you can do is converse with a local surfer who has a little experience under his belt. For snorkelers, this is pretty nice as well. There’s about 50 yards of nice water between the reef and shore. But watch out for the kiters. As with most ocean with coral, the bottom here has its share of sea urchins! Make sure you wear booties. If you’re not into kiteboarding, downwind you’ll find a nice area of sand to enjoy. You can do some snorkeling here as well as diving, although we found the water slightly clearer up wind. There is some good lodging here as well. Highly recommended is Villa Tropical, apartments right on Shacks Beach. Run by Canadians Trevor and Jennifer, you won’t go wrong booking your stay here. 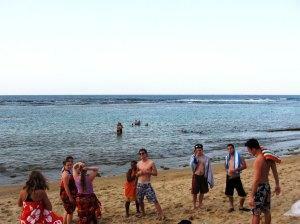 They will make you feel like family and give you all the tips on how to spend your time wisely while at Shacks Beach. Their website is always up to date with the latest pricing and tons of pictures of the area. Contact them today to ask about surfing, diving, or snorkeling in the area and make sure you tell them you found them on Three Best Beaches.